The providers of the game Rumble in the Jungle Slot game are Mazooma Interactive Games having the Video Slots. Its theme is Jungle adventure where the players can find their favorite jungle characters. The game has 5 reels and 20 paylines. The max coin size 25 and min coin size is 0.01. The players can win the bonus games by boxing in a clever way by playing this casino game. As the stake is minimal to 0.01, any person can undertake the jungle adventure that brings much real money for the players. This game has wild symbols but the players can identify it as the word WILD, which will be written on them, and this card multiplies your bet until x500. The scatter symbols in the game are the parrot, Wild Spins card and the monkey. The special card is of the bananas, which appears as the bonus features and the player can win a jackpot too. The betting range in this game can be changed on Stake or Line varies from 0.01 to 25 coins. The numbers of line are easily changed ranging from 1 to 20 lines. Their number can be changed by clicking on lines box. In this game, the maximum bet per spin is 500 credits. This range of active paylines and wagers is interesting for high rollers or the players who want to bet on smaller amount of real money. The Autoplay option helps the player to select 5, 10 or 25 spins to be played in an automatic manner. Players can win the jackpot in two ways: Firstly, if the person lands 5 scattered bananas on the reels or you complete the banana row in monkey award. While completing every row, the player will be rewarded a unique multiplying value. The player should be aware of the rotten bananas as it can end Monkey Bonus. 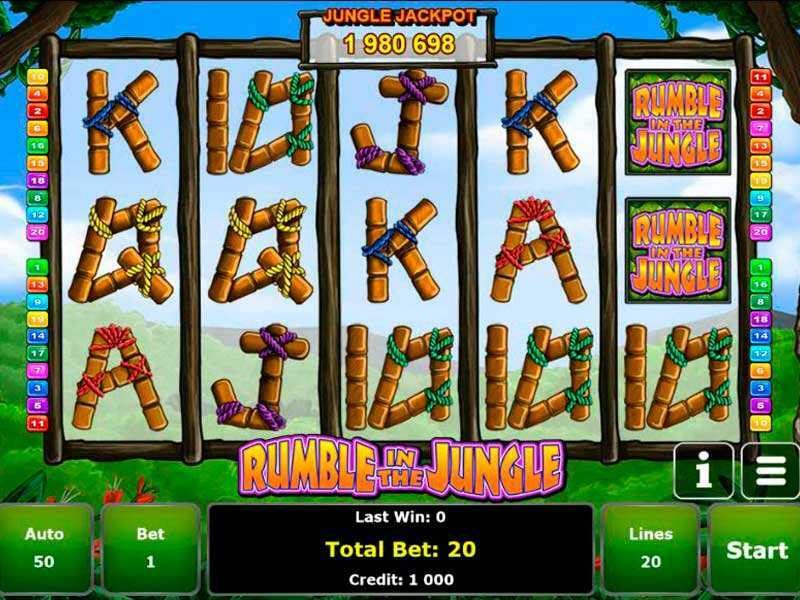 The Rumble in the Jungle Slot game may not be the boxing game like the Ali v/s Foreman, but this slot machine game is better than other slot games. The bonus features and the jackpot value make this game fun-filled. 0 responses to "Rumble in the Jungle Slot"